A spellbinding novel about a troubled young girl and a family in crisis, and a gripping, astonishing portrait of recovery and self-determination. When December opens, eleven-year-old Isabelle hasn’t spoken a word in nearly a year. Four psychiatrists have abandoned her, declaring her silence to be impenetrable. Her parents are at once mystified and terrified by their daughter’s withdrawal, and by their own gradually loosening hold on the world tas they’ve always known it. Isabelle’s private school, which until now has taken the extraordinary step of allowing her to complete her assignments from home, is on the verge of expelling her, forcing her parents to confront the possibility that what once seemed a quirk of adolescence, a phase, is perhaps a lifelong transformation, a swift and total retreat from which their daughter may never emerge. December paints an unforgettable picture of a family reckoning with a bewildering crisis, and of a critical month in the life of a bright, fascinating girl, locked into an isolation of her own making and from which only she can decide to break free. 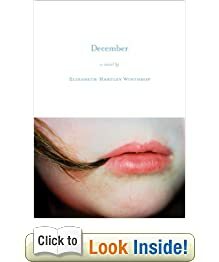 Compulsively readable and deeply affecting, December is a work of marvelous originality and emotional power from a prodigiously gifted young writer. This was a great book. It literally held me captive from the moment I started reading until the very end, leaving me to think about it at night until I could continue to read it again the next day. It is not a fast paced novel. But it definately dives into the innards of the thought process of all main characters, which I think is the part I enjoyed the most. I was struggling with Isabelle as she mourned the fact that she simply could not speak; her anger at herself, her disappointing her parents, friends, and teachers, her fear causes her to draw into herself more and more. I struggled with each parent trying to think of what to do next. Each parent having their own methods, strategies, and sometimes butting heads with each other, causing more frustration. I think one of my favorite parts is even though this family is going through such a hard time, Isabelle’s parents; Ruth and Wilson are constantly doing things for each other. They rarely forget the simple things, like Wilson leaving the paper and a canister of coffee for Ruth on the nightstand on Sunday mornings, I think is great. And when it fails to happen, you know things are spirling more out of control. I think this is an excellent book! Definately worth the time. I look forward to reading more of Mrs. Winthrop!